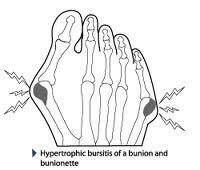 - Sometimes referred to as Tailor's bunion, or a bunionette, is an enlargement of the fifth metatarsal bone at the base of the little toe. The metatarsals are the five long bones of the foot. The enlargement that characterizes a tailor's bunion occurs at the metatarsal "head," located at the far end of the bone where it meets the toe. Tailor's bunions are not as common as bunions, which occur on the inside of the foot at the base of the big toe, but both are similar in symptoms and causes. Dr. Michael Horowitz offers a 5-Step process to successfully treating Tailor Bunions. He can help evaluate & diagnose your condition and recommend the best course of action for you. Call Vancouver Orthotics at 604-737-3668 for more information. What is the most effective treatment for Tailor's Bunions? What exercises & stretches do you recommend for Tailor's Bunions? What other symptoms are most commonly associated with Tailor's Bunions? What shoes are best for Tailor's Bunions? Where can I get medical hardware for high arches?